On the previous page, we showed pictures of ring bus and mesh arrangements. With a ring bus, ultimately the silicon layout of the cores and the interconnects can be regular but are not that stringent. Put the cores in a circle (or overlapping circles) and away you go. With a mesh, things get a little more rigid. The mesh diagrams on the previous page are all presented as rectangles in x*y arrangements. You either have to add a full row or a full column to increase the die count, whereas in a ring it could be straight forward just to add another pair of cores into the ring (which is what happened over the last few generations). 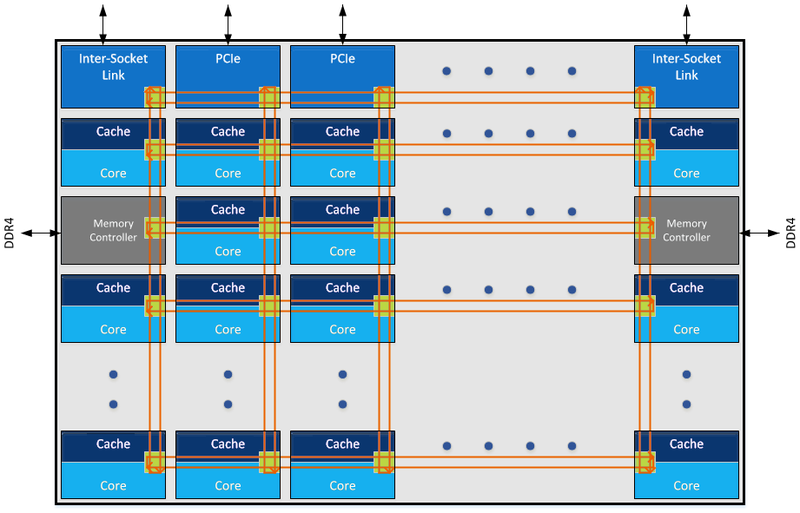 Adding a pair of cores in a mesh means that you end up with more corners and more edges – not all cores end up ‘equal’ and there can be performance penalties therein. Ideally, an arrangement where x = y is usually the best bet. This lets us make some predictions about how Intel’s silicon is lining up. A side-note for discussion. If we had a 100x100 core arrangement, the cores in the middle would have big latency to get anywhere near external memory. Also, a 2D mesh could become a 3D mesh. At the time, we were a bit stumped by this image. By counting the regular structures, we can see 4x5 arrangement, or rather a 20-core chip. On closer inspection two of the cores were different: on the second column, the top and bottom ‘cores’ did not look like cores. At the time we postulated that given the size of AVX512, this might be where they were. But the second piece of information was given through Intel’s mesh announcement. This is meant to be a pseudo mockup of a theoretical core of n processors using the mesh topology. At the top are the socket links, along with the PCIe root complexes. However on the left and right are the DRAM controllers, essentially taking up the same area as a core but also using one of the mesh networking links. What we can see is three regular blue/green vertical areas, which means three on each side, for a total of six. Skylake-X only has four memory channels, but leaks have shown that the new Skylake-SP processors have six memory channels by design, so here they are. 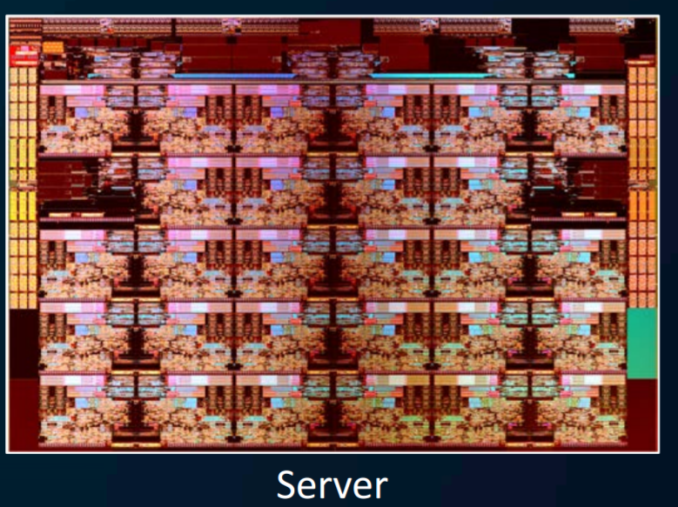 In the 4x5 grid, we have 18 cores and two sets of memory channels. Back when Skylake-X was announced at Computex, I wrote that we were expecting the LCC silicon to be a 12-core design. At this time, we were still expecting Intel to use a ring-bus topology, and I mentioned before, adding two cores to a ring bus is fairly easy at the expense of peak latency between cores. Now that we know that Intel is using a mesh, it is quite different. 12 cores could quite easily fit into LCC silicon in a 3x4 arrangement, but that does not leave any room for the six memory controllers that the enterprise Xeons are all meant to have. If we added two ‘extra’ core sized areas for the 12-core design, we need a total of 14 segments. Using the x*y arrangement as required above, the only way 14 cores works is using a 7*2 arrangement. If this was the case, the DRAM controllers would essentially fill a whole row, or be at opposite ends of the column. If one of the x*y numbers is the number two, it makes more sense to use a ring bus any day of the week for power, die area and simplicity. So that means that the 12-core SKU, the Core i9-7920X, is likely derived from the HCC 18-core silicon. Which also explains why that CPU has been delayed until August. At this point in time, the Skylake-X processors based on the LCC silicon have been in the hands of a few people. At Computex there were several extreme overclocking (using sub-zero coolants) events dedicated to the new processors. One element of recent extreme overclocking is delidding the processor and removing the integrated heat spreader to replace the thermal interface material underneath. In general removing the IHS is not recommended without practice and experience, but for some processors in the past we have seen sizeable temperature benefits by replacing the standard thermal interface material (TIM) that Intel uses. 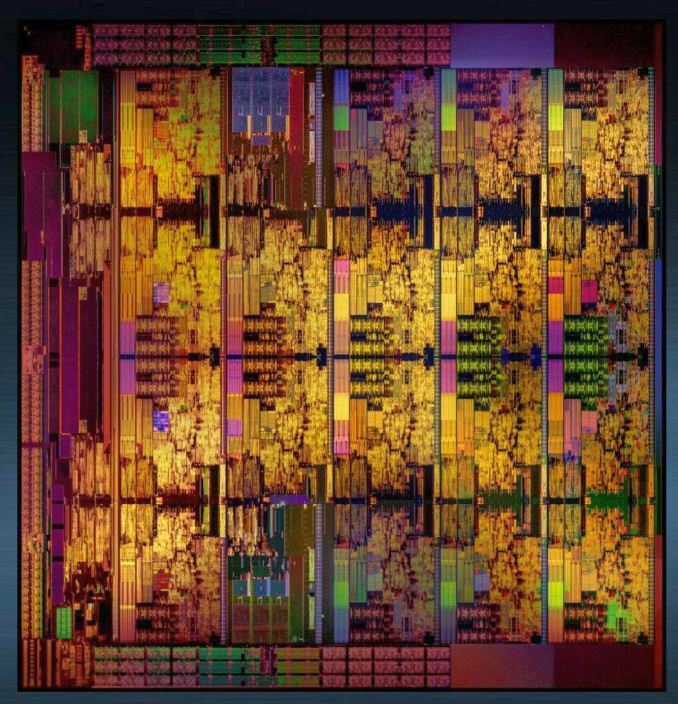 The discussion on whether Intel should be offering a standard goopy TIM or the indium-tin solder that they used to (and AMD uses) is one I’ve run on AnandTech before, but there’s a really good guide from Roman Hartung, who overclocks by the name der8auer. I’m trying to get him to agree to post it on AnandTech with SKL-X updates so we can discuss it here, but it really is some nice research. You can find the guide over at http://overclocking.guide. However removing the IHS means we can measure the silicon die. The 10-core LCC die, which is a 3x4 design, measures in at 14.3 x 22.4, or 322mm2. Using this, working from Intel’s 4x5 HCC diagram (and assuming it hasn’t been stretched), we can get 21.6 x 22.4 = 484mm2 for the high-core count design. That leaves the Extreme core count option. Using the x*y strategy again, Intel could either run a 5x5 design, which gives 25 areas and 23 cores – which is unlikely. Next up is a 5x6 design, which gives 30 areas and 28 cores. 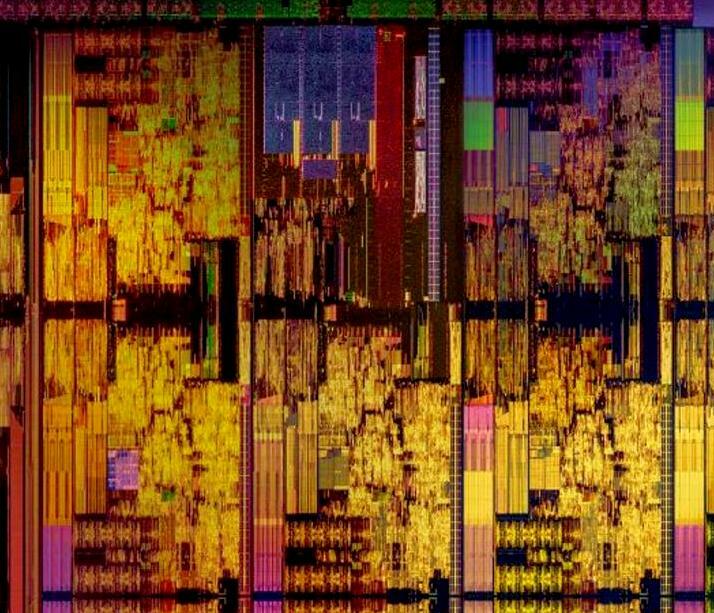 It’s no secret that many leaks are pointing to a 28-core XCC processor at this point. Doing the basic math on a 5x6 design gives us a 21.6 x 32.3 = 698mm2 die size for XCC. Compared to other chips with Intel’s mesh architecture, Knights Landing comes in at 646mm2 (minus MCDRAM), and sources put Knights Corner at 720mm2.